Connection of same diameter round ducts and integration into complex ventilation systems. Made of white plastic. 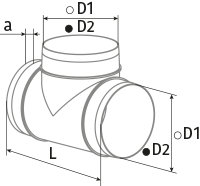 Connection of same diameter three round ducts at 90°.